Now when the seventh week has come, that is, when two weeks, including the seventh, are left before Easter, everything is done on each day as in the weeks that are past, except that the vigils of the sixth weekday, which were kept in the Anastasis during the first six weeks, are, in the seventh week, kept in Sion, and with the same customs that obtained during the six weeks in the Anastasis. For throughout the whole vigil psalms and antiphons are said appropriate both to the place and to the day. And when the morning of the Sabbath begins to dawn, the bishop offers the oblation. And at the dismissal the archdeacon lifts his voice and says: “Let us all be ready to-day at the seventh hour in the Lazarium.” And so, as the seventh hour approaches, all go to the Lazarium, that is, Bethany, situated at about the second milestone from the city. And as they go from Jerusalem to the Lazarium, there is, about five hundred paces from the latter place, a church in the street on that spot where Mary the sister of Lazarus met with the Lord. Here, when the bishop arrives, all the monks meet him, and the people enter the church, and one hymn and one antiphon are said, and that passage is read in the Gospel where the sister of Lazarus meets the Lord. Then, after prayer has been made, and when all have been blessed, they go thence with hymns to the Lazarium. And on arriving at the Lazarium, so great a multitude assembles that not only the place itself, but also the fields around, are full of people. Hymns and antiphons suitable to the day and to the place are said, and likewise all the lessons are read. Then, before the dismissal, notice is given of Easter, that is, the priest ascends to a higher place and reads the passage that is written in the Gospel: When Jesus six days before the Passover had come to Bethany, and the rest. So, that passage having been read and notice given of Easter, the dismissal is made. This is done on that day because, as it is written in the Gospel, these events took place in Bethany six days before the Passover; there being six days from the Sabbath to the fifth weekday on which, after supper, the Lord was taken by night. Then all return to the city direct to the Anastasis, and lucernare takes place according to custom. On the next day, that is, the Lord’s Day, which begins the Paschal week, and which they call here the Great Week, when all the customary services from cockcrow until morning have taken place in the Anastasis and at the Cross, they proceed on the morning of the Lord’s Day according to custom to the greater church, which is called the martyrium. It is called the martyrium because it is in Golgotha behind the Cross, where the Lord suffered. So when the dismissal has been made in the great church, that is, the martyrium, the bishop is escorted with hymns to the Anastasis, and after all things that are customary on the Lord’s Day have been done there, after the dismissal from the martyrium, every one hastens home to eat, that all may be ready at the beginning of the seventh hour in the church in Eleona, on the Mount of Olives, where is the cave in which the Lord was wont to teach. Accordingly at the seventh hour all the people go up to the Mount of Olives, that is, to Eleona, and the bishop with them, to the church, where hymns and antiphons suitable to the day and to the place are said, and lessons in like manner. And when the ninth hour approaches they go up with hymns to the Imbomon, that is, to the place whence the Lord ascended into heaven, and there they sit down, for all the people are always bidden to sit when the bishop is present; the deacons alone always stand. Hymns and antiphons suitable to the day and to the place are said, interspersed with lections and prayers. And as the eleventh hour approaches, the passage from the Gospel is read, where the children, carrying branches and palms, met the Lord, saying: Blessed is He that cometh in the name of the Lord, and the bishop immediately rises, and all the people with him, and they all go on foot from the top of the Mount of Olives, all the people going before him with hymns and antiphons, answering one to another: Blessed is He that cometh in the name of the Lord. And all the children in the neighbourhood, even those who are too young to walk, are carried by their parents on their shoulders, all of them bearing branches, some of palms and some of olives, and thus the bishop is escorted in the same manner as the Lord was of old. For all, even those of rank, both matrons and men, accompany the bishop all the way on foot in this manner, making these responses, from the top of the mount to the city, and thence through the whole city to the Anastasis, going very slowly lest the people should be wearied; and thus they arrive at the Anastasis at a late hour. And on arriving, although it is late, lucernare takes place, with prayer at the Cross; after which the people are dismissed. On the next day, the second weekday, everything that is customary is done from the first cockcrow until morning in the Anastasis; also at the third and sixth hours everything is done that is customary throughout the whole of Quadragesima. But at the ninth hour all assemble in the great church, that is the martyrium, where hymns and antiphons are said continuously until the first hour of the night and lessons suitable to the day and the place are read, interspersed always with prayers. Lucernare takes place when its hour approaches, that is, so that it is already night when the dismissal at the martyrium is made. When the dismissal has been made, the bishop is escorted thence with hymns to the Anastasis, where, when he has entered, one hymn is said, followed by a prayer; the catechumens and then the faithful are blessed, and the dismissal is made. On the third weekday everything is done as on the second, with this one thing added—that late at night, after the dismissal of the martyrium, and after the going to the Anastasis and after the dismissal there, all proceed at that hour by night to the church, which is on the mount Eleona. And when they have arrived at that church, the bishop enters the cave where the Lord was wont to teach His disciples, and after receiving the book of the Gospel, he stands and himself reads the words of the Lord which are written in the Gospel according to Matthew, where He says: Take heed that no man deceive you. And the bishop reads through the whole of that discourse, and when he has read it, prayer is made, the catechumens and the faithful are blessed, the dismissal is made, and every one returns from the mount to his house, it being already very late at night. Then, after the dismissal at the martyrium, they arrive behind the Cross, where only one hymn is said and prayer is made, and the bishop offers the oblation there, and all communicate. Nor is the oblation ever offered behind the Cross on any day throughout the year, except on this one day. And after the dismissal there they go to the Anastasis, where prayer is made, the catechumens and the faithful are blessed according to custom, and the dismissal is made. There then, until about the fifth hour of the night, hymns and antiphons suitable to the day and to the place are said, lessons, too, are read in like manner, with prayers interspersed, and the passages from the Gospel are read where the Lord addressed His disciples on that same day as He sat in the same cave which is in that church. And they go thence at about the sixth hour of the night with hymns up to the Imbomon, the place whence the Lord ascended into heaven, where again lessons are read, hymns and antiphons suitable to the day are said, and all the prayers which are made by the bishop are also suitable both to the day and to the place. And at the first cockcrow they come down from the Imbomon with hymns, and arrive at the place where the Lord prayed, as it is written in the Gospel: and He was withdrawn (from them) about a stone’s cast, and prayed, and the rest. There is in that place a graceful church The bishop and all the people enter, a prayer suitable to the place and to the day is said, with one suitable hymn, and the passage from the Gospel is read where He said to His disciples: Watch, that ye enter not into temptation. The whole passage is read through and prayer is made. And then all, even to the smallest child, go down with the Bishop on foot, with hymns to Gethsemane; where, on account of the great number of people in the crowd, who are wearied owing to the vigils and weak through the daily fasts, and because they have so great a hill to descend, they come very slowly with hymns to Gethsemane. And over two hundred church candles are made ready to give light to all the people. On their arrival at Gethsemane, first a suitable prayer is made, then a hymn is said, then the passage of the Gospel is read where the Lord was taken. And when this passage has been read there is so great a moaning and groaning of all the people, together with weeping, that their lamentation may be heard perhaps as far as the city. And when they arrive before the Cross the daylight is already growing bright. There the passage from the Gospel is read where the Lord is brought before Pilate, with everything that is written concerning that which Pilate spake to the Lord or to the Jews; the whole is read. After this, when the dismissal at the Cross has been made, that is, before the sun rises, they all go at once with fervour to Sion, to pray at the column at which the Lord was scourged. And returning thence they sit for a while in their houses, and presently all are ready. Now, when it has been put upon the table, the bishop, as he sits, holds the extremities of the sacred wood firmly in his hands, while the deacons who stand around guard it. It is guarded thus because the custom is that the people, both faithful and catechumens, come one by one and, bowing down at the table, kiss the sacred wood and pass through. And because, I know not when, some one is said to have bitten off and stolen a portion of the sacred wood, it is thus guarded by the deacons who stand around, lest any one approaching should venture to do so again. And as all the people pass by one by one, all bowing themselves, they touch the Cross and the title, first with their foreheads and then with their eyes; then they kiss the Cross and pass through, but none lays his hand upon it to touch it. When they have kissed the Cross and have passed through, a deacon stands holding the ring of Solomon and the horn from which the kings were anointed; they kiss the horn also and gaze at the ring . . . all the people are passing through up to the sixth hour, entering by one door and going out by another; for this is done in the same place where, on the preceding day, that is, on the fifth weekday, the oblation was offered. And when the sixth hour has come, they go before the Cross, whether it be in rain or in heat, the place being open to the air, as it were, a court of great size and of some beauty between the Cross and the Anastasis; here all the people assemble in such great numbers that there is no thoroughfare. The chair is placed for the bishop before the Cross, and from the sixth to the ninth hour nothing else is done, but the reading of lessons, which are read thus: first from the psalms wherever the Passion is spoken of, then from the Apostle, either from the epistles of the Apostles or from their Acts, wherever they have spoken of the Lord’s Passion; then the passages from the Gospels, where He suffered, are read. Then the readings from the prophets where they foretold that the Lord should suffer, then from the Gospels where He mentions His Passion. Thus from the sixth to the ninth hours the lessons are so read and the hymns said, that it may be shown to all the people that whatsoever the prophets foretold of the Lord’s Passion is proved from the Gospels and from the writings of the Apostles to have been fulfilled. And so through all those three hours the people are taught that nothing was done which had not been foretold, and that nothing was foretold which was not wholly fulfilled. Prayers also suitable to the day are interspersed throughout. The emotion shown and the mourning by all the people at every lesson and prayer is wonderful; for there is none, either great or small, who, on that day during those three hours, does not lament more than can be conceived, that the Lord had suffered those things for us. Afterwards, at the beginning of the ninth hour, there is read that passage from the Gospel according to John where He gave up the ghost. This read, prayer and the dismissal follow. And when the dismissal before the Cross has been made, all things are done in the greater church, at the martyrium, which are customary during this week from the ninth hour—when the assembly takes place in the martyrium—until late. And after the dismissal at the martyrium, they go to the Anastasis, where, when they arrive, the passage from the Gospel is read where Joseph begged the Body of the Lord from Pilate and laid it in a new sepulchre. And this reading ended, a prayer is said, the catechumens are blessed, and the dismissal is made. Now, on the next day, the Sabbath, everything that is customary is done at the third hour and also at the sixth; the service at the ninth hour, however, is not held on the Sabbath, but the Paschal vigils are prepared in the great church, the martyrium. The Paschal vigils are kept as with us, with this one addition, that the children when they have been baptised and clothed, and when they issue from the font, are led with the bishop first to the Anastasis. The bishop enters the rails of the Anastasis, and one hymn is said, then the bishop says a prayer for them, and then he goes with them to the greater church, where, according to custom, all the people are keeping watch. Everything is done there that is customary with us also, and after the oblation has been made, the dismissal takes place. 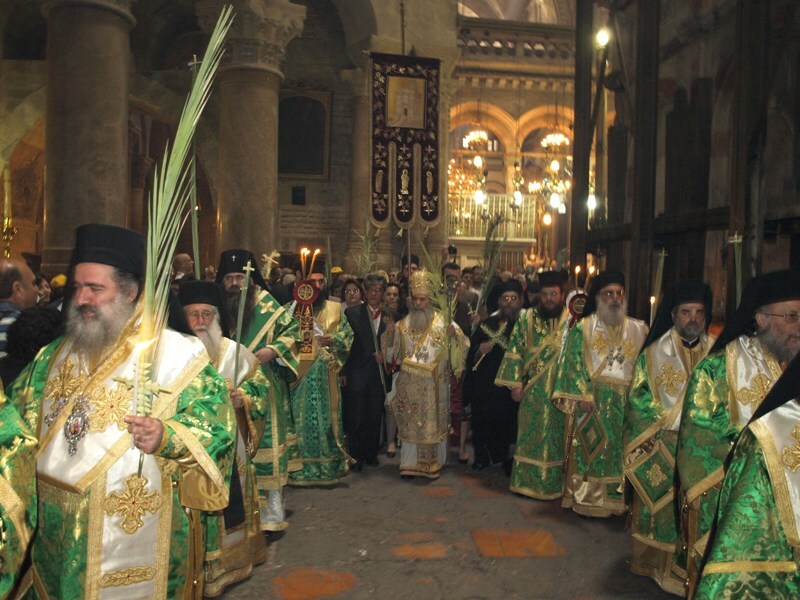 After the dismissal of the vigils has been made in the greater church, they go at once with hymns to the Anastasis, where the passage from the Gospel about the Resurrection is read. Prayer is made, and the bishop again makes the oblation. But everything is done quickly on account of the people, that they should not be delayed any longer, and so the people are dismissed. The dismissal of the vigils takes place on that day at the same hour as with us. Quote | This entry was posted in Sermons & Liturgy. Bookmark the permalink. I would not think so. But pieces of the “true cross” (relics) are believed by many to have been preserved and are venerated by Orthodox and Catholic Christians. This is an interesting video by the Catholic Franciscans in Jerusalem, showing how Calvary and “the Anastasis” (Church of the Resurrection) appeared through time. Egeria would have known the buildings of the Constantinian age. It’s easy to see the open-air set-up between the buildings, and the place “behind the cross”. I find this completely fascinating. (I usually watch without the sound – the background audio has nothing to do with the presentation.) The focus is on the hill of Golgotha, so Bethany, Gethsemane and “the cave where Jesus taught” are not shown.